This was witnessed by myself and my partner Karen in Ruislip, Nw London England. We live quite near to military bases RAF Northolt etc. We see quite a lot of strange things here apart from the usual chemtrails and Electrical Haarps. This evening (1st Aug 2011 approx 7:15pm) while we were sitting in the garden on our decking enjoying the good weather, there was a leerjet or such coming in to Northolt – Nothing unusual as they fly in/out VIP’s all day. But straight after it in the same flight path was a very unusual looking object. It came out of nowhere. To me it looked like a diamond shape which was rolling along at great speed. To Karen it was round in shape and metallic. It wasn’t very high. And although it was difficult to make out what shape it really was, it was very clear to the eye and quite low. I had my mobile phone with me and tried to take pictures. We looked at the pictures afterwards but it didn’t seem to appear in them. However, I downloaded the pictures and looked at them on my PC. It is there! But it’s still hard to make out the exact shape. I’m sticking with diamond. Karen rang her father after the incident as she hadn’t witnessed anything like it before. Her parents live closer than us to the air base and he said there had been “Things” going on there all day. Sirens going off, helicopters up and about etc. 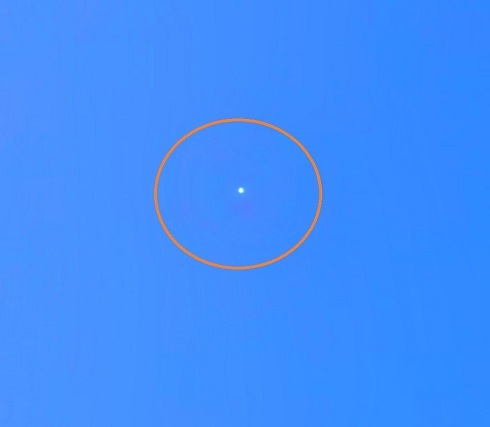 This sighting report and photo was submitted to World Ufo Photos. KEN PFEIFER WORLD UFO PHOTOS.